Music streaming industry hits $1 billion | What Hi-Fi? Figures posted by the Recording Industry Association of America (RIAA) show that streaming revenue for the first half of 2015 has reached $1 billion for the first time, overtaking sales of music on physical media in the US. 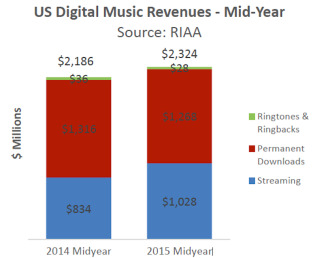 The RIAA reports that the revenue from music streaming services in the US has grown 23 per cent in the first six months of 2015 to $1.03 billion. This is up from $834 million in the same period of 2014. Revenue includes paid subscriptions, streaming radio services, and non-subscription on-demand services such as YouTube and the free ad-supported version of Spotify. The value of paid subscriptions to services such as Spotify and Rhapsody has also increased, having grown to $478 million, a 25 per cent year-on-year increase. The number of people subscribed to a music service in the US has also grown, from 7.9 million to 8.1 million. These figures don’t take Apple Music into account, as it launched on the last day of the reporting period. Subscribers to Apple Music are estimated to be around 7.5 million globally. The RIAA’s figures also show that music streaming services contributed 33 per cent of total industry revenues in the first half of 2015, compared to 26 per cent in the previous year. In the same period, revenues from downloaded music fell by 4 per cent and sales of physical formats were down 17 per cent to $748 million. However, vinyl sales were up 52 per cent and accounted for 30 per cent of physical shipments and 7 percent of the overall market share. The RIAA was keen to point out that vinyl sales contributed more to the music industry than the ad-supported on-demand category. Of course, these figures just represent the music industry in America and not that of the UK. The Official Charts Company said that there were 11.5 billion streams in the UK during the first half of 2015, a rise of 80 per cent on the same period the previous year. Revenue data has yet to be reported.